Ok! 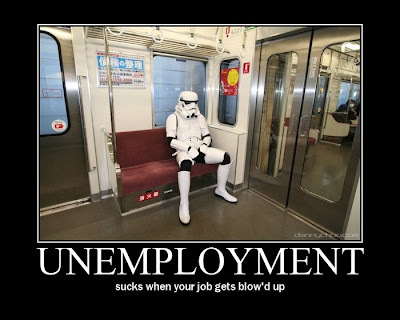 I am officially got bitten by vacation bug right now with most of the folk have left for their hometown in their respective state. Dang! The entire North-South highway situation is crawling with losta car and any vehicle in a state of "bumper to bumper" situation that can unload choking smoke fumes in nano second and perhaps (almost) that the old fashion walking is much faster. No wonder so many accident happen due to neverending jam that similar to what we have back at Capital City where patient is a prized virtue. 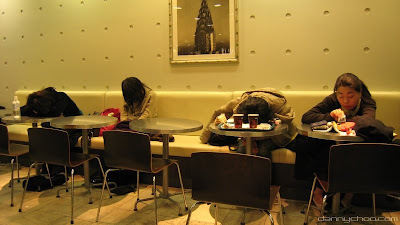 Maybe we should follow the example of the folk of Japan when you arrive at any Mcdonald outlet, the 1st thingy to do to order something, to eat and drink (a freshly brewed coffee will be nice) ,find a perfect spot and fell asleep like an angel or devil depending to what is your preference choice. We been travelling for hour.Time for snooze!ZZZZZZZ! 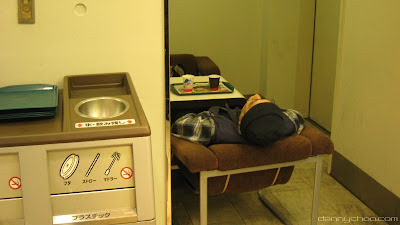 Major Difference I see that Mcdonald at Japan have fold up matress to sleep!